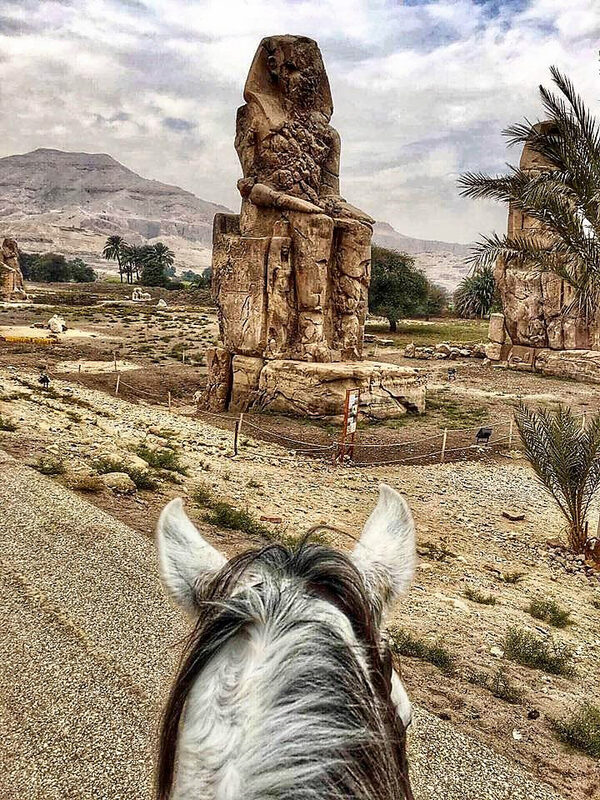 First day in the saddle, through villages, banana and sugarcane plantations to the Colossi of Memnon and Habu Temple aboard the beautiful Gypsy. 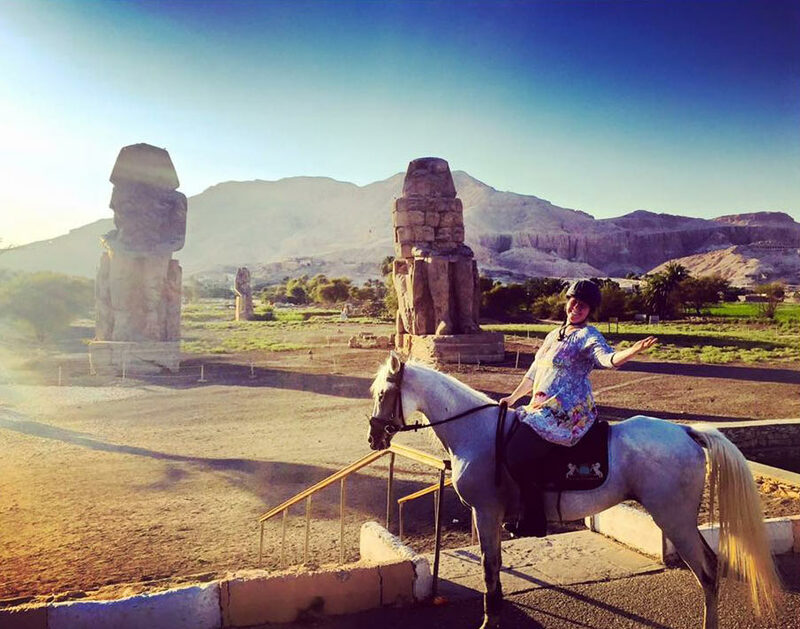 The colossi are statues of Pharoah Amenhotep III are 3,400 years old!! 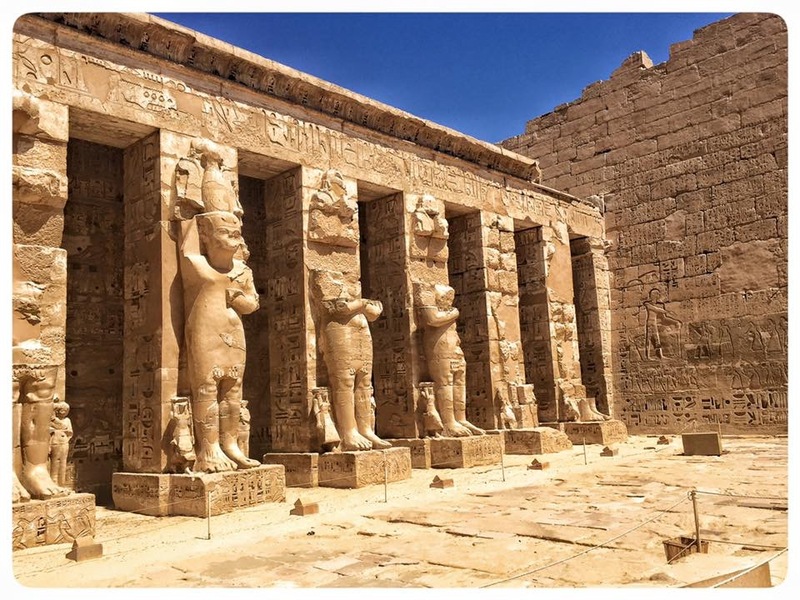 Habu Temple (Medinet Habu) is the mortuary temple of Ramesses III and was constructed around 2,500 years ago. The mind boggles at the sheer age of these structures!! Day 2: Today was a massive day! It is difficult to choose my favourite photos, as I love them all! First, The Valley of The Kings. I visited Tutankhamun’s tomb and saw his mummy and gold sarcophagus, and visited the tombs of Ramesses I, VI and VII (a total of 12 Ramesses ruled in total) and Merenptah, which were all amazing. Then The Valley of The Workers (the workers who built the tombs). Whilst much smaller, they are also spectacularly decorated and painted. Absolutely incredible!! Day 3: Another huge day today! 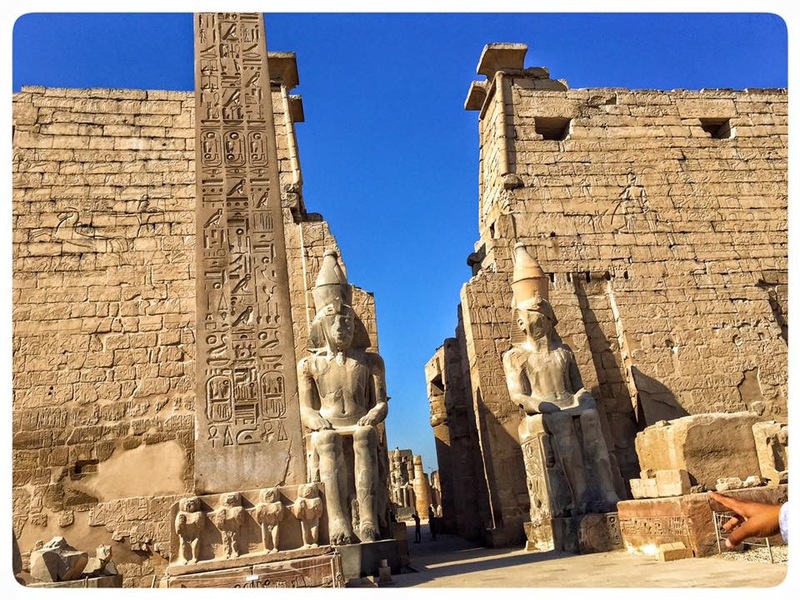 First we begin with Luxor Temple, constructed in around 1400 BC. Then onto Karnak Temple. An avenue of Rams head sphinxes lead to the entrance. The hypostyle hall is truly awesome in every sense of the word. There are 134 of these great columns, in 16 rows. Twelve of these columns are 21 meters tall with a diameter of 3 meters; the others are merely 10 metres tall! It is an incredible site! The sacred lake would have looked far more spectacular 3000 years ago when it was connected to The Nile. It’s purpose: for the bathing and cleansing of the Pharoah only. The temple complex is enormous, with many separate buildings and squares. Amazing! This afternoon, we went on the most amazing long ride through the villages, with the children running out of the houses to wave and say hello, and the banana plants shading us. The local farmers gave us fresh dates straight from the palms, and the mountains looked stunning in the light. 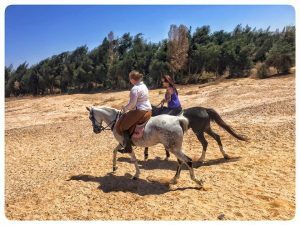 Galloping across the desert beneath the mountains that house the ancient tombs was a once in a lifetime experience. Absolutely incredible! Finally, a carriage ride to the souks where I bought spices, teas, frankincense and myrrh!! No gold though. The traffic and activity is absolutely crazy, and these horses are the most bomb proof animals I’ve ever seen. Day 4: Today was the last opportunity to bask in the presence of the ancient Gods. First, we visited the Valley of the Nobles (the chefs, the scribes, the city officials), but again no photography was permitted. Afterward, we roamed the spectacular Temple of Queen Hatshepsut, one of only three female Pharoahs. Her temple is built into the side of the Mountain over whose peak lies the Valley of The Kings. From there to the Ramesseum, a small and quiet mortuary temple dedicated to Pharoah Ramesses II (Ramesses the Great). Day 6: Horsing around in Makadi Bay. 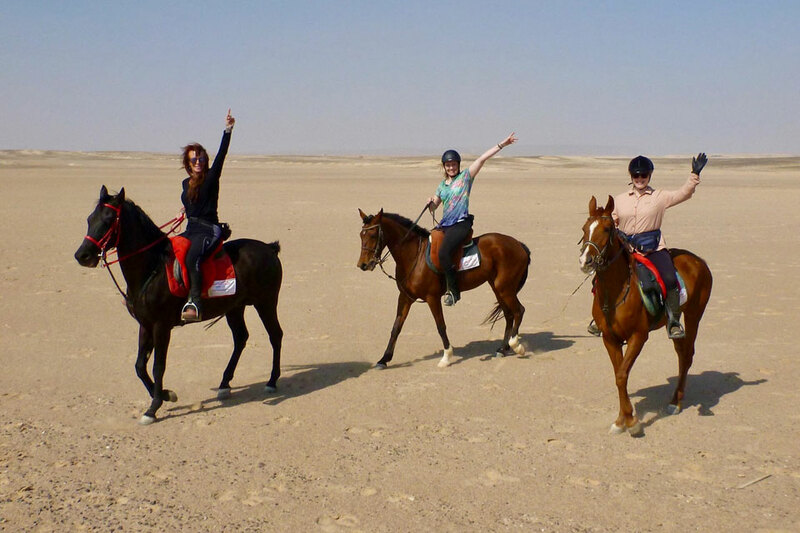 We galloped through the endless desert and along the beaches, then had a swim with the horses in the Red (turquoise!) Sea. 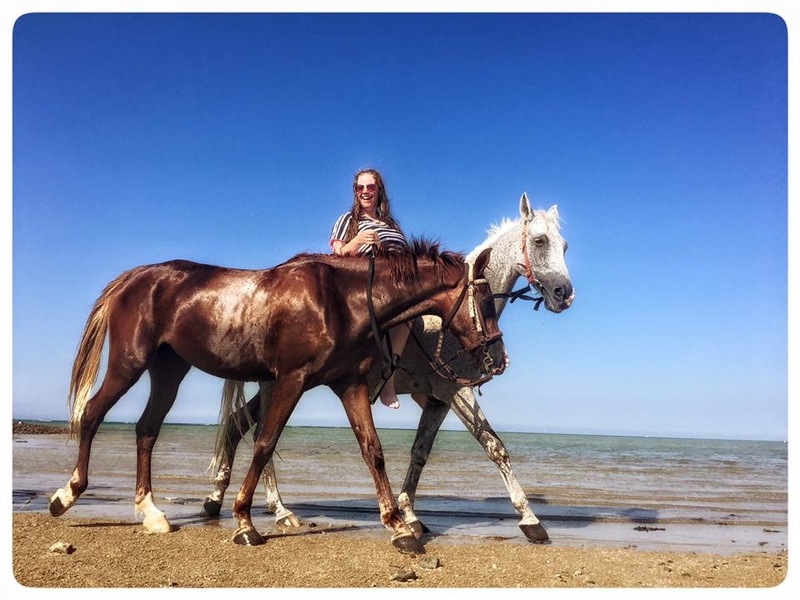 My mumma mare’s little bubba came along with us, and managed to keep up even at a full gallop. She did take full advantage of the milk bar every time we stopped though! Such a wonderful day! Day 7: Today we had a slow day wandering through the forest. Yes, a forest! 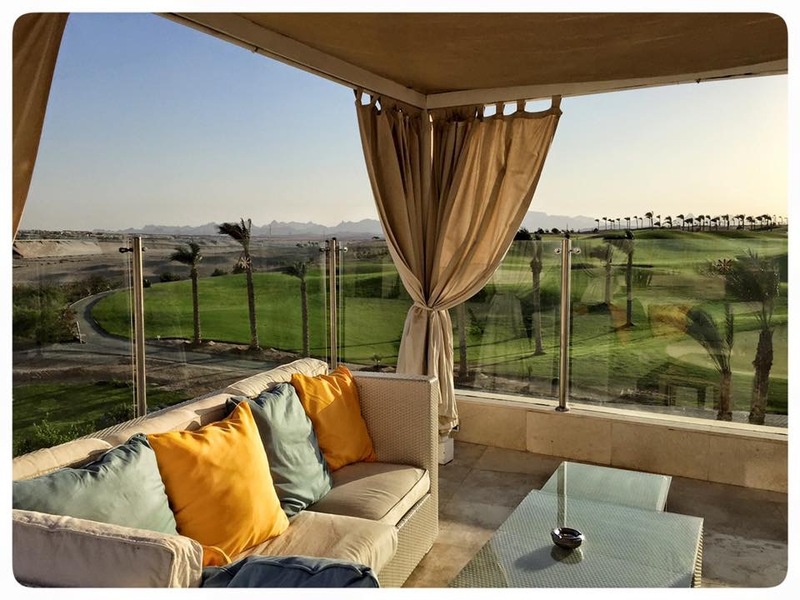 In the desert! Afterward, I came back to the hotel and checked out their beach. Last riding day tomorrow! Day 8: Our last riding day today. We paddled in the crystal clear waters of Makadi Bay, and flew across the deserts with the mountains in the background. Just magic!! I will truly miss my friends Emma and Ganun from Ride Egypt. They are wonderful people, and I have had the most amazing and perfect holiday thanks to them. Ganun is a whizz with the camera, carrying my bag, taking videos, and always smiling. 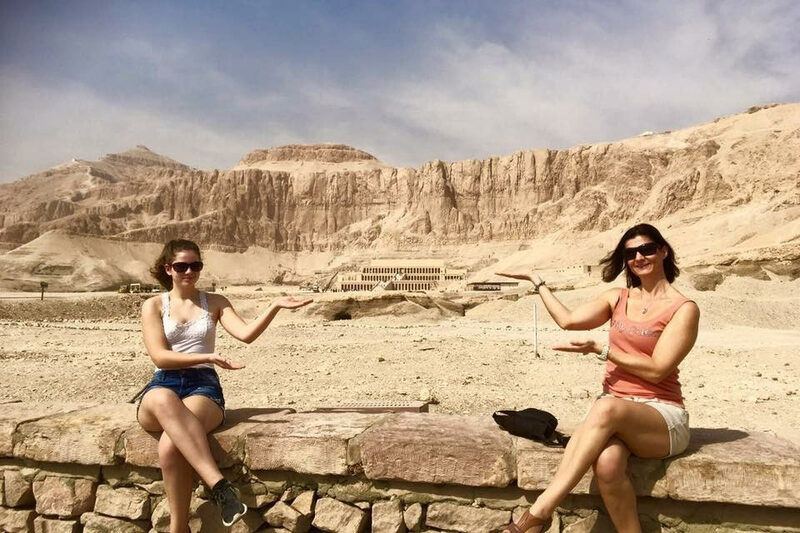 Emma is friendly, lovely and she gets me  Who knew I would find my people in Egypt?! I am already planning on coming back next year! 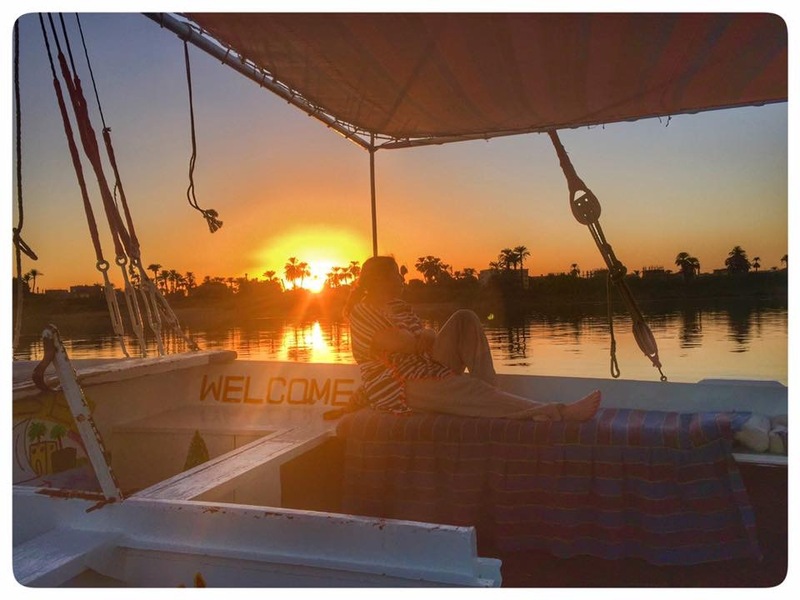 Day 9: My last day in Egypt  Off home in the morning. Today was all about cocktails, massages, reading, swimming, eating, and watching the sun set over the mountains. Big hugs again to Emma and Ganun for making my holiday absolutely awesome! See you next year! 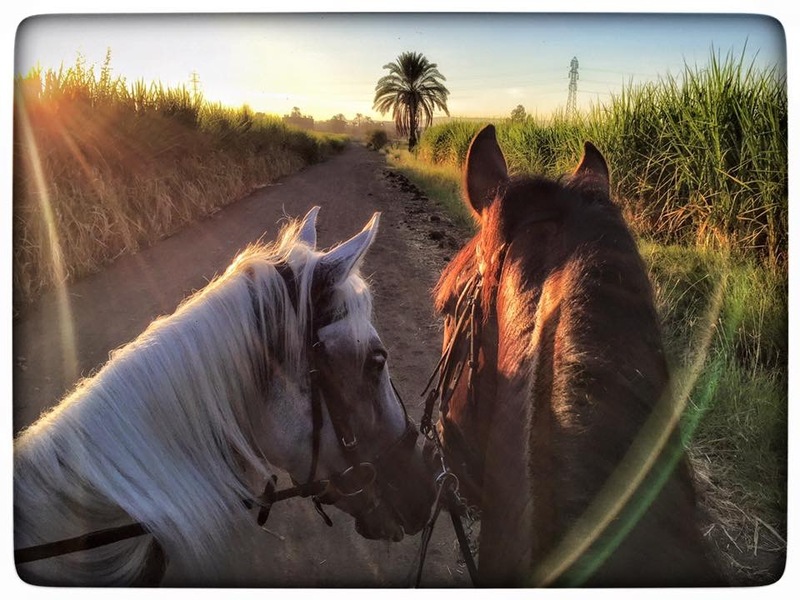 So excited to announce that Life Between The Ears picked one of our photos from Luxor to showcase as this month’s feature Chronicle of the Horse / Untacked | May June 2017. 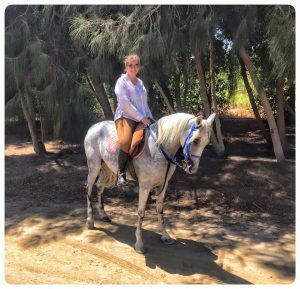 I was asked to do a small interview about my back-story and life in the saddle. Such an honour!